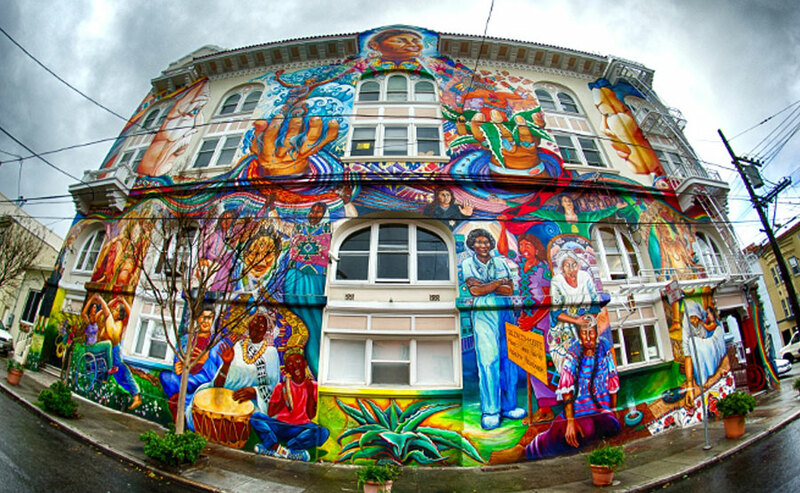 Founded in 1979, The Women’s Building, and its famous MaestraPeace Mural, is a well-known landmark of the Mission District. Located in a neighborhood internationally known for its rich collection of murals, MaestraPeace Mural stands apart for its grand scale and unified style. Originally painted in 1994, it daily attracts the awe and cameras of tourists from around the world, and is seen by them and the San Francisco Bay Area community as a work of artistic achievement and a symbol of the contributions of women throughout history and the world. In a city of sky-rocketing property prices, inside The Women’s Building, bi-lingual staff provide critical social services to low-income women and families, affordable office space to other nonprofits serving women, girls and families, and affordable rental space for nonprofits, families, activists and community groups for meetings, educational workshops and celebrations.